In the tense months before America's entry into World War II, a series of agreements with Great Britain gave the United States a set of bases located strategically with respect to the North Atlantic shipping lanes. In 1940, as a part of the "Destroyers for Bases" agreement, an area at Argentia, Newfoundland, was set aside for the development of an American naval bases. In July 1941, American Marines replaced British forces who had been defending Iceland, and contract construction for additional facilities in Iceland was begun that fall. Meanwhile, arrangements had been concluded whereby, under the Lend-Lease agreements of March 1941, contractors from the United States built four naval and air bases in northern Ireland and Scotland. These bases, all located near the northern entrance to the Irish Sea, were designed primarily to service craft for anti-submarine patrol at the eastern terminus of the North Atlantic sea lane to English ports on the Irish Sea. From the Destroyers-for-Bases agreement entered into between the United States and Great Britain on September 2, 1940, our government received the right to develop a naval base at Argentia, Newfoundland. 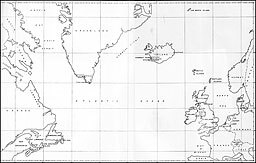 It had become apparent that an anti-submarine patrol should be established to keep open Atlantic shipping lanes and guard American coastal waters, and the decision was made to develop a major air station on the route between [the] United States and Europe. Contractors, who were working at the time on the naval air station at Quonset Point, R.I., were instructed to begin preliminary work and site-preparation at Argentia. Field work was started on December 29, 1940. 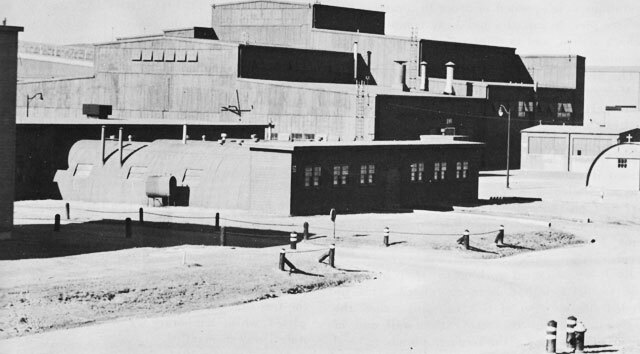 When the air station was usably complete, early in 1942, an expansion of facilities at Argentia was proposed to include a complete naval operating base. Work on this expansion was begun by the contractors and continued by Seabees, who first arrived at Argentia on October 12, 1942. Following their arrival, extensive developments were made by both the contractors and the battalions until the contractors were relieved on May 5, 1943. Subsequently, all work was performed by military personnel. Because the site of construction was in an isolated area where housing, skilled labor, supplies, and utilities for construction were practically unavailable, it was necessary to construct a complete camp, including housing, utilities, shops, warehouses, and office facilities, before actual construction of the air station could be accomplished. The original "camp" at Argentia was on board the SS Richard Peck, which had formerly sailed between New York and New Haven. Originally tied to an antiquated pier, and later to pile-dolphins with a ramp to shore, the Peck provided dining facilities and housing for the nucleus of the American construction forces. Local Newfoundland labor lived and subsisted in fishing schooners anchored in the harbor and found their way back and forth to the temporary quarters in dories. With the arrival of building material, barracks and mess halls were constructed, and all the problems of community life were immediately presented, not in slow steps, as would happen in a growing community, but suddenly and drastically. mess halls located in the immediate vicinity of each group. At the start of operations, the peninsula of Argentia was covered with a layer of peat varying from a few feet to 20 feet in depth, necessitating the removal of approximately 8,341,000 cubic yards of peat and general excavation. The excavated peat was hauled to disposal points along the outer shoreline. Below the peat, a formation of sand and gravel proved to be excellent for use as fill and for stock to be run through the crushing plant to produce sand and coarse aggregate. The crushing plant produced approximately 136,000 tons of sand and 186,000 tons of coarse aggregate for concrete and asphalt work. The airfield contained three runways, 300 feet wide and 5,000 feet long. Included with the runway work were 10-foot-wide drainage slopes, gravel shoulders, and gutters. The runways were surfaced with plant-mixed, hot asphaltic concrete which was applied in two layers by paving machines. Generally, the base course was compressed to three inches and the topping compressed to one and a half inches. Some 193,500 tons of asphalt were produced in blending and mixing plants erected on the base. At first, the blending plant and fluxing equipment, including tank trucks, were rented from a commercial oil company, but were subsequently purchased through the Navy Supply Office at Argentia; the mixing plant, capable of producing 50 tons per hour, was purchased outright. Asphalt was processed to a liquid-heated state in the blending plant and supplied to the asphalt mixing plant, whence it was delivered in open trucks to the point of use. Approximately 810,000 square yards of base course were laid, with approximately 740,000 square yards of asphaltic topping. Because of the importance of the airfield, excavation and grading for runways was given first priority. When the grading was accomplished, the asphalt base course was laid. Three runways were completed for emergency use in the fall of 1940; the top course was applied in the spring and summer of 1942.
cubic yards of material from the seaplane-ramp area and 803,000 cubic yards from the outer harbor. Areas were dredged and swept to depths of 30 feet or more. To care for cargo ships, a 50-by-300-foot extension was added to the original railway wharf. When it became evident that more than one cargo ship would be unloaded simultaneously, another 250-foot extension was added. A stiff-leg derrick was erected for unloading shovels, tractors, and other heavy equipment. The wharf was later used by the operating forces for naval marine equipment. A 2,000-foot marginal wharf was constructed to connect with the north end of the temporary wharf. Half of the wharf deck, which was supported by creosoted piles, consisted of vertically laminated planing with steel shear developers over which finished concrete deck was poured. The remaining 1,000 feet was supported in like manner with 4-inch plank decking. Fender piles, bollards, and mechanical services were also furnished. Concrete was transported to this and various other job sites by mixer-trucks. These were loaded at a batching plant which included a testing laboratory, a cement warehouse, a loading hopper, a batching bin, and a fresh-water well and supply system with a 2,000-gallon storage tank to supply mixing water. lines, and steam service were available at various points along the wharf. The railroad track was extended to run along the wharf to facilitate the loading, unloading, and distribution of materials and supplies. At the waterfront of the seaplane-parking area, a bulkhead was constructed of steel sheet-piling, braced and tied into the shore. From this bulkhead, two seaplane ramps extended into the bay. The ramps were constructed of concrete, cofferdams being used. Three boathouses, supported on piles, were included in the marine work. Although the general building-construction program really commenced with the erection of barracks, mess halls, warehouses, officers, and temporary buildings, the first building projects completed for military operations were a temporary bachelor officers' quarters and a Marine barrack. Of semi-permanent wooden-frame construction, they housed the original contingent of 100 Marines and their officers. A mess hall, 14 two-story barracks for naval personnel, and a three-story three-wing building which housed approximately 300 officers were then built. The structures were of wood on prefabricated structural steel, with asbestos siding and floors of wood and asphaltic tile. Corridors connected the barracks and the mess hall and bakery. The industrial area buildings, of prefabricated structural-steel with asbestos-protected metal exteriors, included a seaplane hangar, aircraft utility shop, acetylene charging shop, oxygen storage room, alcohol storage room, aircraft storehouse, winter-clothing storehouse, cold-storage building, paint and oil shop, torpedo workshop, and bombsight storage room. An operations building and message center and a general storehouse were also a part of this group but were of reinforced concrete construction. The administration building was built with asbestos-shingle siding. In a group of buildings along the shore were a fire station and garage, a station maintenance shop, and laundry and dry cleaning shops. These were all one-story prefabricates structural steel buildings with steel sash and asbestos-protected metal exterior. This group also included a bomb-proof power house; the lower slab of the double roof was 4 feet thick and the burster slab, 6 feet thick. The power plant consisted of three boilers, each with a continuous rated capacity of 50,000 pounds of steam per hour, and three turbines capable of producing 4,000 kva. Around the exterior of the power plant was a protection screen on concrete, 5 feet thick. Steam was delivered through underground mains for use in heating, cooking, and the operation of laundry equipment. Electrical energy for light and power was distributed through underground cables, in ducts encased in concrete envelopes. Standby units were deemed unnecessary, but an interconnection with a local power line was made for emergency use. The Army power system also was interconnected for mutual service. and all the facilities of a complete hospital. A wing of two stories was added subsequently. This building was of wood-frame construction with wooden sheathing and asbestos-single siding. Inert storehouses, high-explosive magazines, fuse and detonator magazines, a small-arms magazine, a pyrotechnic magazine, and warhead magazines were of wire-mesh reinforced-concrete arch construction and were buried for concealment and protection. Several larger buildings, such as the aircraft storehouse addition, the airfield control tower, and the gymnasium, were of timber construction. Timber connector-rings were utilized extensively in the structural members of these buildings. Construction roads were developed in order to provide access to the various areas under construction. One of the most important of these areas was the storage area for fuels and lubricants. A fuel-oil and diesel-oil storage farm was developed, consisting of six welded-steel storage tanks and six prestressed-concrete tanks, with an individual capacity of 1,134,000 gallons, making the total capacity for the storage of fuel and diesel oil, 13,608,000 gallons. One of these tanks was later converted to 80-octane gasoline storage. In the same vicinity, two welded-steel storage tanks of 13,500-barrel capacity each, were erected for the storage of 100-octane gasoline. These tanks, of prestressed, gunite-covered, latex-lined, concrete, designed to conserve steel, were all placed underground. A second tank farm was developed for the storage of 100-octane gasoline. This consisted of 24 tanks with an individual capacity of 25,000 gallons, two bulk tanks of 10,000 gallons each, and one of 567,000 gallons, making the capacity of the farm 1,367,000 gallons. The farm was fed through a 10-inch pipe from the marginal wharf and an 8-inch line from two finger-piers, and gasoline was disbursed at the parking areas through an aqua system. The entire operations was electrically and hydraulically controlled. In addition to furnishing 100-octane gasoline at the parking areas, arrangements were made to dispense gasoline to the Army through a tank-car loading platform. At the start of building operations, the only light and power available was supplied by a line which furnished 50 kva, and by 85-kva diesel generating plants, owned and operated by the local light and power company. With the growth of the camp and the increase in power consumption for construction purposes, added electrical energy was required. As the result of negotiations with the local company, a power line was constructed from a hydro-electric plant, 64 miles from the base. This line supplied 1,500 kva and delivered it at 33,000 volts to transformers which converted it to 2,400 volts for use on the base. Due to the excessive bad weather during the winter, conditions warranted the installment of two steam turbines in the SS Richard Peck to be used as stand-bys. These were fed by the ship's boilers. These generators augmented the local supply by 750 kva. As permanent buildings were completed and the camp load increased, it became evident that until the permanent power plant was operative, some source of temporary power would be necessary. One of the permanent turbines was selected and arrangements were made for temporary operation. This turbine generated 1,000 kva, using steam from a boiler already installed in its permanent position. In the final permanent power plant, current was generated from two 1,500-kva and one 1,000-kva alternators. A 6-inch main from a series of lakes, about a mile from the base, originally furnished the only fresh water. This supply, while pure, was inadequate and uncertain. An attempt was made to drill wells to augment the supply, but salt water was encountered, and the effort was abandoned. The base was connected with an Army supply which was furnished by a larger lake and watershed through a 12-inch line. The water was chlorinated and pumped into nine underground reservoirs of 500,000-gallon capacity each, giving a total underground storage of 4,500,000 gallons. These reservoirs were connected in a loop, thereby ensuring an adequate supply of fresh water if one or more reservoirs or pipelines were damaged. A fresh water pumping station delivered the water form the reservoir to the point of consumption. In addition to the underground storage, three elevated prefabricated riveted-steel water tanks were erected to float on the line in the event of a pressure drop. These furnished sufficient pressure for normal distribution and supplied emergency pressure to the sprinkler systems located in various buildings. in the seaplane hangar, general storehouse, aircraft storehouse, paint and oil shop, and aircraft utility shop. The salt-water system for fire protection consisted of lines to hydrants along all roads and at all buildings. A pumping station fed this system. On October 12, 1942, the first section of the 17th Construction Battalion arrived at Argentia and was assigned to the maintenance and operation of completed utilities and structures, previously operated by civilian employees of the contractors. Additional members of the battalion arrived on March 17, 1943, and most of them were assigned the duties of manning the shops, plants, and equipment. The balance of the group was placed on new construction projects. On March 27, 1943, the first section of the 64th Battalion arrived, closely followed, in April, by the second section. The 64th was engaged principally in new construction work. On June 17, the 69th Battalion arrived. On May 5, 1943, the civilian contractors were relived of all activity, a large portion of the base construction having been completed. The work performed by the battalions, which were consolidated to form the 10th Construction Regiment, consisted of operations of every character, including the building of heavy industrial structures, wharves, bulkheads, installation of floating drydocks, earth and peat removal, road and runway construction, and general maintenance work. One of the projects was a reservoir development, which included the formation of a series of ponds to impound 175,000,000 gallons of water. In addition to building a dam, the Seabees constructed a sluiceway from one pond to another, and installed control works at two ponds. Other assignments included the completion of 84 quonset huts, reconstruction of the BOQ after its destruction by fire, erection of a temporary BOQ during the reconstruction period, and fabrication of a public works warehouse. During the month of April 1943, the 64th Battalion started work on eleven projects, including a salt-water pumping station, a second boathouse, the drydock development which had been started by the contractors, several radio buildings, and four barracks. operations were speeded in order to complete the inshore pier, to install a bulkhead complete with tieback system, and to construct a pontoon bridge to connect the pier and the drydock. The first two sections of the dock arrived early in May and the remaining two sections during the latter part of May. By June 1, all sections were in position and had been secured to the anchorage. During June, concrete sinkers were installed, the main wooden keel blocks were removed and replaced in concrete, the bilge blocks were altered and reinstalled, and temporary mechanical services and energy units were provided to permit operation of the dock before final completion. On June 26, 1943, the drydock was submerged to receive its first ship. By July 1, all steel work on the shop buildings for the drydock had been completed. This included the erection of two traveling-cranes, the completion of the concrete curtain-wall and of much of the floor slab, roofing, plumbing, and electrical lines. By September 1, 1943, completed projects included extension of the gasoline-storage area, extension of the water-supply and fire-protection systems, a radio and radar workshop, and oil storehouse, a laundry building, and several additional magazines. During September and October, the entire drydock area was completed and placed in operation. All roads and walks, as well as all railroad tracks, were finished. One of the most important projects, though not the largest, undertaken by the Seabees at Argentia was the increase in the length of the airfield runways, including the finishing for drainage and the rolling and oiling of shoulders. The project lasted from June 1943 until the latter part of August, at which time it was virtually complete, the only exception being one runway which required the placement and compaction of 10,000 cubic yards of fill plus the oiling of all extended shoulders. By the end of October, all drainage work was completed and the base course of asphalt was laid. Substantial completion of all new construction was effected during the month of November. The scope of operations included the completion of all authorized runway extensions, laying of approximately 6,700 tons of asphalt paving, and the installation of utilities to service the expanded facilities. On November 17, 1943, CBMU's 525 and 526 arrived to take over the station maintenance. The next day the 17th Battalion was detached, except for a small contingent of 45 key enlisted men, who were transferred to the maintenance units to indoctrinate the units in their assigned functions. On December 6, 1943, the 69th Battalion was relieved. The completion of all projects for which materials were on hand was accomplished during December; and on January 1, 1944, the 64th Battalion and the 10th Regiment completed their duty at Argentia. On February 9, 1944, the two CBMU's were consolidated and the public works officer was designated as officer in charge. Argentia presented a peculiar situation in regards to roll-up, as construction work was continued during this period. The explanation lay in the fact that permanent facilities were being completed while temporary or emergency facilities were being dismantled. After January 1944, many projects, started by the battalions and left unfinished because materials were lacking, were completed by the maintenance unit. These included net-depot facilities, a draft curtain for the seaplane hangar and storehouse, sidewalks, and a fuel-oil recovery system. 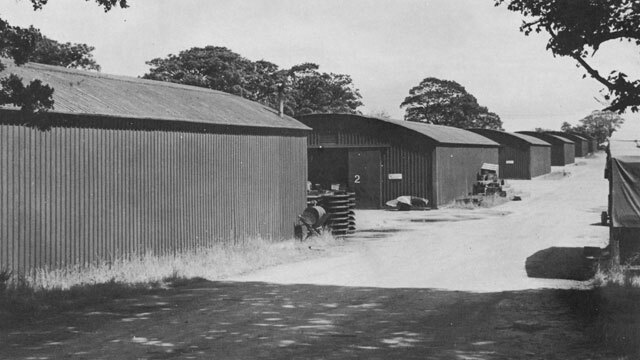 In addition, many new projects were started, including the replacement of quonset huts by more permanent barracks. Native civilian employees were trained to carry on the regular maintenance operations so that by September 1, 1944, it was possible to reduce the CBMU personnel from 500 men and 11 officers to 296 men and 8 officers. In May 1940, a month after the Axis invasion of Denmark and Norway, the British landed troops in Iceland to protect that country from possible invasion and also to provide a base for patrols to protect shipping to the British Isles. Military facilities were not available in Iceland for these troops or for bases, so it was necessary for the British to construct them. An agreement between the British and the Icelandic government stated that no more than 2,200 Icelanders would be used by the British, because no more than that number could be spared from the fishing industry, the main source of livelihood to Iceland, without impairing the local economy. that under such an arrangement their required construction could not be completed as rapidly as desired, and requested that the United States construct fuel-oil storage facilities. These facilities, located on the barren and rocky shores of the Hvalfjordur, were to provide storage for 164,000 tons of fuel oil. Part of the storage was to be used for fuel oil used by the British in Iceland, and part to care for the trans-shipment of fuel oil from American bottoms, as the Neutrality Act prohibited American ships from going to England. The labor required for the construction of these fuel-oil storage facilities was to be paid for by the British; the required material, and later the labor costs also, was furnished through Lend-Lease. The United States agreed to this request in the early summer of 1941. It was decided to construct the required facilities by using the organization already engaged, under a CPFF contract, in construction of Navy installations at Newfoundland, drawing on available men and equipment at the construction projects under way at Quonset Point and Davisville, R.I. Although the construction contract was not signed until September 25, 1941, procurement of material by the contractor at Quonset Point was underway before this, and the first shipload arrived at Iceland during the latter part of October. Al American labor for work in Iceland was hired by the contractor, but by this time, August and September 1941, there was beginning to be a shortage of skilled workers available for overseas work, partly because of the expansion of the Defense program in the United States and partly because of a reluctance on the part of civilians to sign a contract for a year's work far from home and under unknown conditions. Meanwhile, upon the invitation of the government of Iceland, United States forces occupied Iceland. On July 7, 1941, the President of the United States informed Congress of this occupation, giving the basis for the occupation as (1) the threat against Greenland and the northern portion of the North American continent, including the adjacent islands; (2) the threat against all shipping in the North Atlantic; and (3) the threat against the steady flow of munitions to Britain. Atlantic Fleet, on September 12, pointed out the necessity for aerial patrol activities, and on September 25, 1941, the Chief of Naval Operations directed that a base be constructed for the operation of one squadron of patrol planes near Reykjavik. This base was to consist of housing and administration facilities, repair facilities, and seaplane ramps, and was to be designated as a fleet air base. The first contingent of American civilians to reach Iceland consisted of 133 men, who arrived on October 29, 1941. The original intent had been to use all these men on the construction of the fuel-oil facilities; however, 48 of them were sent immediately to begin the air base, leaving 85 men to unload the supplies from the SS Chattanooga, on which they had arrived, and the SS Alchiba, which arrived a week later. While the erection of the camp at the fuel depot was proceeding, the 48 men at the air base were erecting housing facilities for aviation personnel. By the end of December 1941, the number of workmen on the project had increased to 50 Americans and 65 Icelanders. In spite of the many difficulties encountered, the base was placed in operation at this time, and on January 21, 1942, the fleet air base was commissioned. Work was greatly hampered by the severe wind and snow storms of that winter, including a 130-mile gale in the early part of January 1942, which wrecked a partially completed tank at the fuel depot, and scattered material over a wide area. Huts were blown down at both the fuel depot and the air base. At about this time, negotiations by the Army with the Navy for construction of an Army airfield near Reykjavik were under way. Construction was authorized on November 7, 1941, but no site was selected by the Army until the following February. At the time, the officer in charge of construction was directed to proceed with the construction, the Navy contractor doing the construction. The Navy was to do the work; the Army was to furnish the higher echelons of supervision and troops for unskilled labor. Concurrently, work was started by the Navy contractor on the physical facilities of a naval operating base on the outskirts at Reykjavik. Arrangements for leasing the required land had been undertaken shortly after the attack on Pearl Harbor, and as soon as huts and other materials arrived, construction was started. On February 13, 1942, the Chief of Naval Operations directed that the fleet air base be constructed for two squadrons of planes. A 100-bed hospital was incorporated in the plans for the operating base, and construction proceeded as rapidly as could be expected with the limited force available. During February 1942, the Bureau of Yards and Docks requested the British to enter a formal requisition for the construction of a tank farm at Seydisfjord (an informal request had been made some time earlier), and on February 13, 1942, the British made the formal request that there be constructed at Seydisfjord six 10,000-barrel fuel-oil tanks to replace the tanker which was moored there as a refueling base. To complicate the supply problem further, the USS Lake Osweya, with a cargo of supplies, was lost while en route to Iceland in the early part of March 1942. The pioneering nature of the work, including long hours of Arctic darkness and severe winter weather, tended to slow down progress. By the middle of March, only eight American civilians and 32 Icelanders were employed on the construction of the naval operating base. It was at this time that first consideration was given to the use of contingents of the newly organized Seabees. As the naval activities expanded, it was necessary to initiate construction of ammunition storage, and work was started on this in March -- contractors' men being used as they could be spared from other more urgent jobs. The maximum number employed on this project was 25. On March 28, the Chief of Naval Operations approved the construction of a floating pier in the Hvalfjordur at the fuel depot. The shortage of workmen continued to be serious, and by early April of 1942, there were only 368 American and 325 Icelanders on the various projects. On May 8, 1942, there arrived 25 of the contractor's men to begin work at the Army airfield.On May 20, a second contingent of 165 workmen arrived, and on May 25, the first of the contractor's heavy-equipment operators and earth-moving men went to work on the first airstrip, called Patterson Field, which was to be a fighter field. Meanwhile, construction had proceeded so well at the naval operating base, that on May 16, 1942, it was formally commissioned as Camp Knox. Yards and Docks proposed to the commandant of the operating base that Seabees be used to replace the contractor's men on the various projects, it having become evident that it would be impossible to obtain enough American civilian workmen to accomplish the authorized construction within the time allotted. As a result, arrangements were begun to ship Seabees to Iceland. On July 2, excavation was started on the east-west runway of the huge central airfield, called Meeks Field. During the middle part of the month, 15 Seabee welders arrived and were immediately put to work at the fuel depot. By the last of the month, storage space for 240,000 barrels of fuel-oil was ready and fuel oil was being stored. All 44 of the oil tanks had been erected, and 30 of them were complete with piping and appliances. The arrival on August 18, 1942, of the 9th Construction Battalion, comprising 704 enlisted men and 17 officers, signaled the beginning of a new and busier phase of construction. The Seabees rapidly replaced the contractor's forces. On the first of September, all the contractor's employees, except 71 of the key men at the Navy fuel depot and the Army airfield left Iceland on the same ship that had brought the Seabees. The civilian workmen at the fuel depot were relieved by September 20, 1942, and those at the airfield by the middle of October. October signalized the end of good construction weather and the start of a winter-long struggle to meet the goals set for the completion of the various projects. This was particularly true in the case of the Army airfield, which was scheduled to be completed by April 1, 1943. 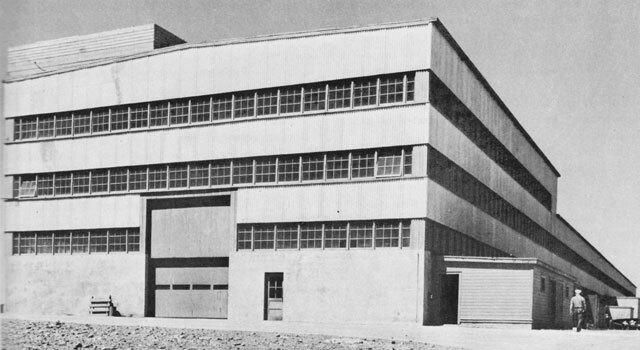 On October 28, 1942, the naval ammunition depot was commissioned. In addition to the heavy earth-moving, paving was started on the Army Patterson Field on October 26, in an attempt to get at least one strip in operating condition before winter weather set in. By November 25, a landing strip, 3,500 by 100 feet, had been paved, before heavy rains and snows caused the filled-in material to bog completely. on this frozen surface, the frost melted, forming mud pools under the impervious asphalt. This condition was overcome by laying a porous-mix base course that allowed the water to escape in the form of steam. The first large concrete job to be undertaken at the Army airfield was for a 175-foot-by-206-foot steel hangar at Meeks Field. The 44 footings for the columns were poured while snow was on the ground; steel erection was made difficult by the high winds. On December 4, 1942, the first contingent of the 28th Construction Battalion, consisting of 310 enlisted men and 10 officers, arrived and was immediately sent to the Army airfield where they were put to work with members of the 9th Battalion. On December 22, the remainder of the 29th Battalion, consisting of 674 enlisted men and 16 officers, arrived. These men were immediately distributed among the Army airfield, the fleet air base, and the fuel depot forces. Logistics, climate, and geography combined to offer almost every conceivable obstacle to construction. The terrain was tundra-covered, broken with boulders and ledge outcroppings. It had been vaguely mapped, was devoid of roads and subject to violent winds. Ingenious engineering improvisations and utter disregard for physical hardships were necessary to overcome innumerable obstacles. The major task was placing sufficient asphalt paving. A quota of 1,500 square yards of asphaltic concrete paving per day for 121 days (December 1 to March 31) was essential to meet the requirements. Early in February 1943, a series of break-downs occurred in both the asphalt plant and the rock crusher. In spite of all these difficulties, the first plane to use the field landed on March 26, 1943, five days in advance of the originally scheduled completion date. 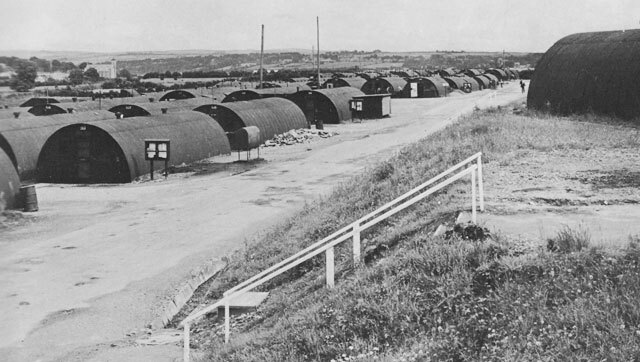 In April 1943, construction was completed at the ammunition depot. By the first of May 1943, the first 376,000 square yards of asphalt paving at Meeks Field had been completed. The placing of the second 189,000 square yards of asphalt was done in less than three months as compared to the five months required for the placing of the first 189,000 square yards. new taxiways, new dispersal areas, and the hangar apron were filled to grade. By July 1, 1943, all paving was completed at Meeks Field, a total of 1,074,419 square yards of base course and 895,309 square yards of topping having been laid, and efforts were redoubled at Patterson Field. Paving was completed there on August 21, a total of 427,788 square yards of base course and 427,778 square yards of topping having been laid. By the first of August 1943, the fleet air base was essentially complete. The first of the Seabees to be returned to the United States were 34 enlisted men from the 28th Battalion, who left Iceland on July 27, 1943. On August 25, CBMU 514, composed of 5 officers and 267 enlisted men, arrived at Reykjavik. In addition to the maintenance at the naval operating base. Seabee personnel were assigned duties with the port director, took over all master-at-arms duties at the naval operating base, were given key commissary and galley assignments, and were assigned to the recreation division and the disbursing office. With the arrival of the CBMU, members of the 28th Battalion were relived of duties at the fleet air base, leaving only the detachment at the fuel depot and CBMU 514 to do the necessary construction and maintenance at the several bases. The 28th Battalion left the area on October 2, 1943. On November 1943, the transfer of the naval fuel depot to the British was authorized and word was received that the British would take over about the first of the year. By this time, the fuel depot was 100 percent complete and had been in use for some time. Early in December, Icelandic civilians, who were to work for the British, began arriving at the fuel depot and were indoctrinated by the Seabees. On December 20, 1943, the fleet air base was closed with the provision that if turned over to the British it would be returned to United States control upon 60 days notice. 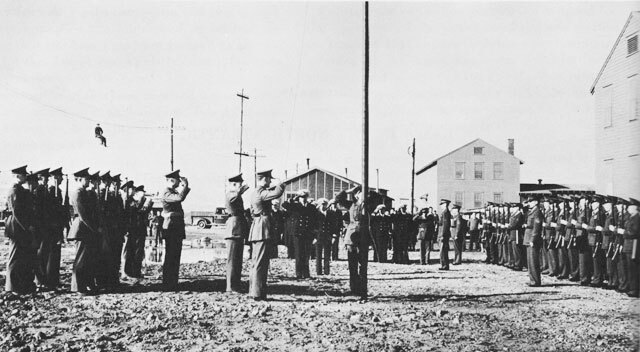 In January 1944, the 28th Construction Battalion detachment at the fuel depot was redesignated as CBMU 586, and then was redesignated Construction Battalion 146. On January 21, 1944, the fuel depot was turned over to the British. Ten days later, the fleet air base was evacuated by United States naval forces, the huts and a limited amount of equipment being turned over to the British. Most of the equipment, such as comfort gear, recreation gear, technical apparatus, galley and bakery equipment, and the major proportion of the refrigeration apparatus, was packed and crated by CBMU 514 and accompanied the 146th Construction Battalion to its new assignment. After turning the fuel depot over to the British, the 146th Seabees moved to the naval operating base to await further transportation. On February 2, 1944, a portion of the battalion departed from Iceland for the United Kingdom, and on February 18, the remainder left for the same destination to act as a special petroleum unit in preparation for the invasion of France. During the spring of 1944, only routine maintenance work was done. On May 16, 1944, the Chief of Naval Operations directed that naval personnel in Iceland be reduced to an overall total of about 200 officers and men, exclusive of the Marine detachment, and the ammunition depot be dismantled except for such huts or buildings as might be desired by the British. The maintenance unit did the salvage work, surplus materials and equipment in usable condition being shipped to the European Theater of Operations. In November 1945, the British returned the air station, the fuel depot, and the ammunition depot to the United States Navy. Seabees were used as guard forces. 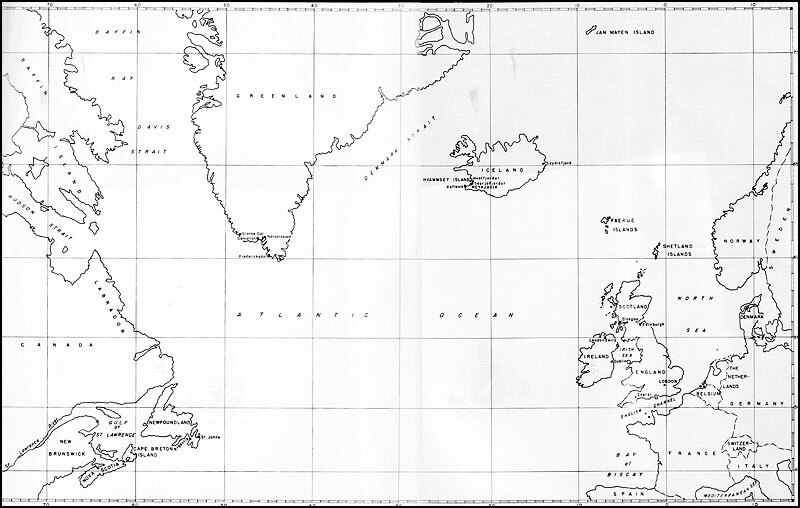 On September 24, 1943, the officer in charge of CBMU 514, then stationed in Iceland, was directed to confer with the officers of the United States Coast Guard and the representatives of the Royal Norwegian Navy concerning the construction of a radio direction finder station on Jan Mayen Island, situated in the Arctic Ocean, between Greenland and Norway. The most serious obstacle encountered during construction operations at Jan Mayen was not the rugged mountainous terrain, the cold Arctic weather, the frozen ground, or the volcanic structure of the rock, but the landing of supplies, material, and equipment through the heavy surf in small boats. The problem was solved by prefabricating as many items as possible in iceland, where shop facilities were available, and limiting their size and weight to permit beaching through the surf in the boats. assembled, marked, and crated for shipment. This entailed a great deal of scurrying around and ferreting out of crucial equipment, and improvising when certain items were not available, for there was not sufficient time to order and receive the necessary items from the United States. Army Engineers cooperated fully, so that by November 4, when the specially selected construction crew departed for Jan Mayen, they were able to complete their assignment within a month, and that despite adverse weather conditions and the long Arctic night. The Seabees erected a two-story main building to house the delicate instruments and equipment; a 20-by-48-foot hut with prefabricated built-in cupboards, bunks, and bulkheads for berthing and messing of the operating Coast Guard personnel, and a storage building. The buildings had to be designed without much definite information as to the frozen terrain, velocity of the winds (reported as being well over 100 knots part of the time), snow load, and the camouflage problem (enemy reconnaissance planes came over at regular intervals). For these reasons, conventional design methods were discarded and the buildings were laid out in a manner that would make them as strong and as rigid as the available materials would allow and also permit the erection at the site in as short a time as possible. There was little daylight and no sun at the island during the period the men were working. In the spring of 1944, members of another special details from CBMU 514 were sent from Iceland on June 12 to Jan Mayen, with orders to make the station more livable, as it had been decided to keep it in operation for some time.This group returned to Iceland on August 3, with the report that the work had been completed ahead of time. As a result of an agreement reached on April 9, 1941, between the governments of Denmark and the United States, American troops occupied Greenland on June 13, 1941. The Navy's general tasks in Greenland were to defend sea communications between Greenland and North America, to defend shipping in the coastal waters of Greenland, and, supported by the Army, to prevent access to the territory and territorial waters of Greenland by any hostile elements or the nationals or agents of belligerent non-American nations. All construction work in Greenland was done by private contactors, working under the direction of the Army. In the construction of Navy facilities, the Bureau of Yards and Docks, directed by the Chief of Naval Operations, made arrangements with the Army for the construction work. The Army supplied labor and construction implements, and the Navy supplied all materials except in cases where the Army happened to have a surplus. From July until December 1943, when the contractor's work was completed, one CEC officer from the Atlantic Division of the Bureau of Yards and Docks was attached to the construction site in Greenland. a foam system for the protection of the tank farm was installed. Naval projects at Greenland included a naval operating facility at Grondal, a naval facility at Nararssuak, a radio station at Gamatron, and a loran project at Frederiksdal. The operating facility at Grondal was used as a fueling station and minor repair base. The following installations were constructed: a 105,000-barrel tank farm, a camp for 16 officers and 130 enlisted men, a radio and visual signal station, a crib pier with 590 feet of berthing space, two cruiser-type moorings, a machine shop, a 250-pontoon drydock, 2,000 square feet of ammunition storage, emergency seaplane facilities, general storage facilities, and base maintenance shops. The facility at Nararssuak was used as a command center and an operating point for naval patrol planes. It was located on part of the Army air base at Nararssuak. 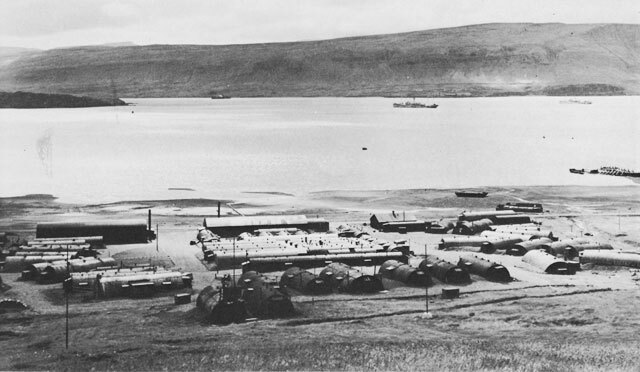 This facility's installation consisted of a camp for 70 officers and 310 enlisted men, an administration office for the commander of the Greenland Patrol, ammunition storage space, facilities for the operation and maintenance of seven PBY's, a radio station, general storage facilities, base maintenance shops, and one cruiser-type mooring. 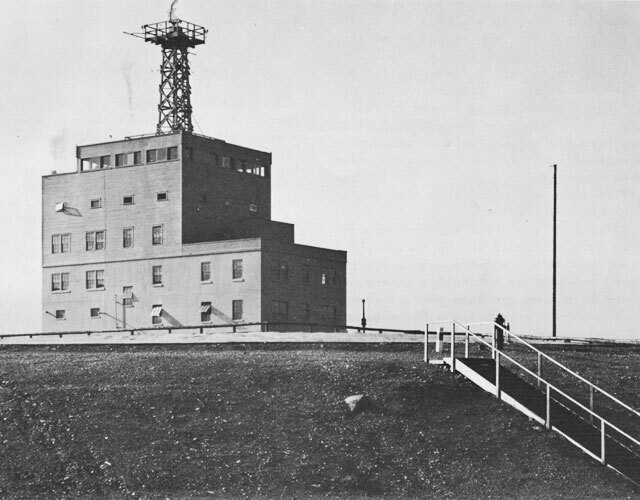 The radio station at Gamatron consisted of a radio and direction-finder station with a camp for one officer and 40 enlisted men. Military protection of this installation was maintained by the Army. The loran project at Frederiksdal, which was operating by the Coast Guard, contained housing facilities for one officer and 20 men. 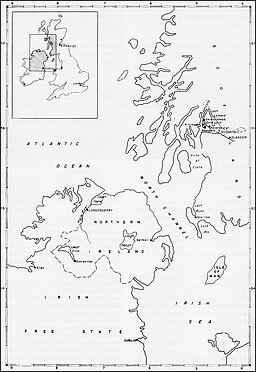 In April 1941, arrangements were made with the British government to construct four naval bases in Northern Ireland and Scotland, at Londonderry and Lough Erne in Ireland and at Rosneath and Loch Ryan in Scotland. Funds for the construction of these bases were to be provided by both the British and the American governments, in accordance with Lend-Lease agreements reached in March 1941. Londonderry and Rosneath were to provide repair and fueling facilities for destroyers and submarines, ammunition storage, hospitals, and barracks for shore-based personnel; Lough Erne and Loch Ryan were to be used principally as operations centers for seaplane squadrons. After the entry of the United States into the war, the construction of a huge pipeline in the vicinity of Rosneath was begun. Approximately 1,150 American workers and 4,800 local workers, mostly Irish, were employed in the construction of these bases, which represented the initial effort of the United States Navy to erect portable facilities overseas. Supervision was given by 25 officers of the Civil Engineer Corps. With the advent of war, Londonderry immediately became a port of inestimable value as a base for North Atlantic convoy escorts. These escorts consisted principally of destroyers and lesser craft of the United States, Canadian, and British navies. The essential North Atlantic sea lane had its terminus in ports bordering the Irish Sea in western Scotland and England. As the maintenance of this thin supply line through the ever-tightening German blockade was imperative to the continuance of British resistance, the top priority was given the project of establishing at Londonderry the first United States naval base in the United Kingdom. Londonderry is situated some 4 miles up the River Foyle, on the northern coast of Ireland. Its location also made it the most suitable port for the allocation of supplies to other projects. Four miles downstream from the city of Londonderry, and on the opposite bank, an area, known as Lisahally, offered deepwater and adjoining land space sufficient for unloading and storing large quantities of supplies. A week before the contract was signed in Washington on June 12, 1941, the CEC officer-in-charge arrived in Londonderry to prepare the way for the arrival of contractor's forces and construction materials and equipment. was placed on dispersal as a defense against bombing attacks, which, except for one minor incident, never materialized. Work on the most pressing projects -- the first of the personnel areas at Beech Hill, the storage area at Lisahally, and the ship-repair facilities -- began in mid-July, when the first ship loaded with tools, equipment, and materials arrived from the States. In September the job expanded to include the second large hut camp at Beech Hill and the administration area. By October, the first pile-driving rigs had been received and assembled, and pile driving was begun for the loading wharf at Lisahally. At the same time, work was in progress on all the major projects except the tank farm, for which materials were a long time in arriving. With the United States' entry into the war, a new plan of strategy was evolved which materially changed the base-building program in the European theater. Under this program, Londonderry was commissioned as a naval operating base. Notable additions were a 750-foot extension to the 1000-foot loading wharf at Lisahally and enlarged radio installations. The size of the hospital was reduced from 500 to 200 beds. By the first of the year, work was being pressed to the utmost in spite of the almost incessant rainfall and the much-shortened daylight period characteristic of northern latitudes. Almost 600 Americans and a considerably larger number of Irishmen were employed. In January, most of the magazines in Fincairn Glen were completed, and the first materials for the new warehouses arrived at Lisahally. With the Navy's efforts in European waters centered on escorting convoys, not only to Britain but also to Murmansk, as American aid to Russia was increased. Londonderry promised to remain essential to the fleet and there was not question of relinquishing its control to the British. Londonderry was commissioned as a naval operating base on February 5, 1942, the first outpost of the Navy's shore establishment in the European theater. The first American warship had arrived in December 1941. As enlisted personnel arrived, facilities were placed in operation as quickly as they were usably complete. By February 22, many of the ship-repair facilities and shops were being readied for use; by March 3, the first major group of United States naval personnel had arrived and were quartered in the barracks at Springtown. Much of the original work remained to be done and base operations were constantly expanding, which allowed no let-up in construction activity. By the middle of April, both the hospital at Creevagh and the ammunition depot had been substantially completed. By May 1, work in the industrial area was completed, and a week later the new extension to the loading wharf at Lisahally was ready for use. As the remaining major projects moved rapidly to completion, the attention of the contractor's force was shifted to maintenance, and many skilled workmen were released for transfer to projects in progress in Scotland. The tank farm, begun in April, had been continually delayed by the difficulty in obtaining materials from the United States. However, this did not materially handicap the activity, as the delay had been anticipated and adequate supplies of oil from British sources had been made available. Operating activities along the waterfront were then at a peak in preparation for the invasion of North Africa. 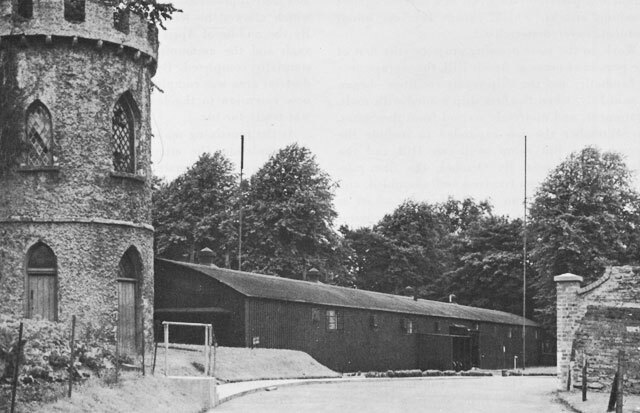 A 250-man addition to the barracks at the Lisahally storage area, approved in August 1942, was completed on September 5. Londonderry ceased to be the focal point of construction effort, and headquarters of the officer-in-charge were moved to Helensburgh, Scotland, where the Dumbartonshire pipeline was the last major project to be constructed under the CPFF contract. A small local office was left in Londonderry, to supervise the force of 1,000 men handling base maintenance and the remaining construction. During the course of the civilian contract at Londonderry, a great naval base had been constructed and put into operation. The work, dispersed over an area of 426 acres, included 1,350 separate buildings, of which 55 were structures either 40 by 100 feet or 60 by 90 feet; more than 90,000 square feet of wharfage; construction and paving of more than 12 miles of roadway; 12 miles of water pipe; 8 miles of drainage ditches; 20 miles of electric cable; 27 miles of fencing; electric generators; and 11 radio masts. In addition, a tank farm for storage of fuel and diesel oil had been erected. and shops, but also for the theaters and recreation buildings; the huts served as living quarters, hospitals, and offices. By January 1943, with the successful completion of the North African landings and the imminent transfer of the Rosneath base to the British, most of the members of the 29th Battalion were available from Rosneath to relieve the 900 contract employees at Londonderry. The 29th carried on maintenance and improvement until relieved by the 97th Battalion in September 1943. A portion of the 97th also relieved a 29th detachment at Rosneath. Fresh from training, the 97th took over the task of completing such construction as was left unfinished. They completed the tank farm, assembled a boiler plant which had been shipped in pieces from the United States, and built pumphouses, quonset huts, and roads. Often, their work was impeded by shortage of materials and by worn-out equipment. On one occasion, using an old pile-driver that was literally falling apart, they built a wharf from such materials as they could salvage. When completed, it supported a 10-ton crane and a 20-ton derrick. In nine months the 29th completed several projects which had previously been in progress under the CPFF contract, including a 300,000-barrel tank farm, three pumping stations and fuel lines, three boiler houses, a 150-foot pier with roads and services, 50 quonset huts, a recreation building, and anti-aircraft gun emplacements. By mid-April, it was possible to assign the bulk of the 29th Battalion forces who had been engaged on the tank farm to the Scottish pipe-line project, where the Seabees again relieved civilian personnel. With the tank farm in partial operation by May, all projects originally planned for construction at Londonderry under the contract were complete. the naval operating base, with general responsibility for maintenance of the shore establishment and operation of the transportation department and the tank farm. This precedent of assigning operative control to Seabees was widely followed in subsequent bases in the United Kingdom. With the arrival of the 97th Construction Battalion in September 1943, it was decided to increase the capacity of the tank farm, in anticipation of the Normandy landings. An unusual Seabee assignment was the mounting of 40-mm. and 20-mm. guns on a large number of landing ships and craft in the spring of 1944. Later, when the base was relinquished to the British, the Seabees removed all critical material for shipment home. Inasmuch as the radio station was to be the sole remaining activity in the area, Seabees erected 40 nissen hits for personnel, before the 97th was transferred to England between June and November 1944. The naval operating base at Londonderry was decommissioned in July 1944. All the men were transferred with the exception of a few storekeepers, a small administrative staff, and two companies of Seabees, who remained to operate the radio station. After they moved to their new locations, the base was turned over to the British, September 3, 1944. During the course of the war, Londonderry was of great importance. Convoy escorts were refueled for their return trip across the Atlantic, and ships which had run the gauntlet of submarine-infested sea lanes, had their damaged hulls and machinery repaired, and such other repairs and improvements as were necessary. Until the creation of Exeter, Londonderry was the main supply depot for our naval activities in the British Isles, and throughout the war, it was the major United States naval radio station in the European theater. The original plan for the Lough Erne base was to provide facilities for four seaplane squadrons, with maintenance, repair, and ammunition-storage facilities, which would require quarters for 3,000 men and a 200-bed hospital. base, it was not used by the Navy, but, to meet the changing situation, was turned over to the Army as a training camp, the seaplane repair and operating facilities being used by the Royal Air Force. Lough Erne lies 35 miles southwest of Londonderry and 10 miles from the Atlantic coast of Northern Ireland. Shaped like a crescent, it is about 16 miles from tip to tip and 5 miles wide. Its ample, protected waters and its strategic location on the westernmost British land in the Isles, near the shipping lanes, made it an excellent site for a seaplane base. The site selected was at Ely Island, 5 miles above Enniskillen, a small village at the end of the lake. On the opposite shore, at Killadeas, less than a mile across the Lough, it was planned to establish the repair base. A suitable site for the hospital was found at Necarne Castle, 8 miles north of Enniskillen and 3 miles from the Lough. The ammunition depot was located 3 miles farther north, at Kiltierney deer park. Preliminary organization began in June 1941. By August 15, equipment, materials, and the contractor's employees had arrived and were ready to carry out the full construction program, which began with personnel quarters for two seaplane squadrons at Ely Island. Next undertaken were the projects at Killadeas, consisting of repair-base and operating facilities for two squadrons. Road construction was given first priority in all areas, as the soil had turned into thick mud by continuous rainfall. An adequate supply of rock was obtainable locally, so the principal roads were usable for heavy machines before the onset of winter weather. were 60 percent complete. The construction of additional roads then allowed work to begin on the hospital and the ammunition depot. In November, when the end of the original work was in sight, further expansion was ordered to accommodate 1,000 men of a Marine battalion, for base defense, and after our entry into the war, the tempo of the job was further increased, until, in February, there were 1,700 men on the payroll, including 130 Americans. However, Lough Erne was never used as a base for American seaplanes, as our participation in an all-ocean war required their immediate use elsewhere. The United States Army, already in the northern British Isles and beginning to concentrate troops which were to invade North Africa, saw here an excellently equipped and well-situated camp and hospital, and requested possession of the base upon its completion. The Royal Air Force also desired to use the camp. The base had been commissioned by the United States Navy, February 5, 1942, and shortly thereafter Chief of Naval Operations approved its temporary transfer to the Army. Later arrangements were made to allow the Royal Air Force use of the seaplane repair and operating facilities. As the Army required an increase in dispensary facilities, the 200-bed hospital, then more than 90 percent complete, was expanded during April 1942 to 500 beds. Late in the month, the first Army forces relieved the naval CEC officer, who remained to effect the formal transfer on July 11. As rapidly as possible, construction was terminated and equipment and material not required by the Army were sent to Londonderry. By June 20, the contractor's forces had been released or withdrawn to Londonderry, and the Army was in full possession. bridges, an ammunition dump, seven electric generators, and all the other facilities required for accommodating and feeding a community of more than 5,000 persons. The installations along the waterfront included 32,000 square feet of beaching areas for seaplanes, four boat slips, six piers, and limited aircraft-overhaul ships, hangars, and storage buildings. The changing fortunes of war precluded use of the base by the Navy, but the base proved of great value to the Army in staging the successful African assault. After that invasion, Lough Erne was officially turned over to the British Army and the Royal Air Force. It continued to serve as a base for anti-submarine patrols in the battle of the Atlantic, and as a British assembly and training camp in preparation for the landings in France. On the rugged western coast of Scotland, the Rosneath peninsula, 2 miles wide and 7 miles long, is bounded by Loch Long, Gare Loch, and the Firth of Clyde. The deep-water channels of the Firth of Clyde and the adjacent lochs are excellent for ship operation. Steamers and small boats connecting the various Clyde ports call at Kilcreggan on the peninsula. Rail facilities, adequate only for small shipments, are located at Garelochhead, 7 miles, and Helensburgh, 14 miles from Rosneath. Rosneath is 40 miles by road from Glasgow, the main railroad, shipping, and industrial center of Scotland. Hilly wooded land adjacent to waterside flat land afforded protective covering for American-built personnel buildings. The ground at different places was characterized by peat, conglomerate rock, and blue clay which made drainage a problem. Almost continuous rain greatly hindered all phases of the work. Historic Rosneath Castle, built in 1860 by the Duchess of Argyl, was used as a transient officers' quarters and mess. Funds were made available for the construction of a naval base at Rosneath under the provisions of a the Lend-Lease Act. Shipments of men and materials started in June 1941. Contract work continued until late in 1942, when completion was undertaken by the Seabees. plus personnel accommodations for 4,500 men and hospital facilities for 600 men. Locations near the village of Rosneath were selected for the industrial and storage area, tank farm, and submarine operations area. The destroyer operating base was to be 2 miles north, along the shore of the loch. Separate sites up the peninsula could be used for the hospital and the ammunition depot. 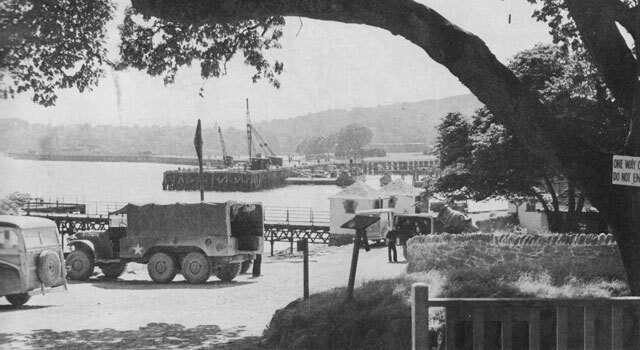 A detachment of Royal Engineers was already engaged in building a shallow-water unloading jetty for barges along the Gare Loch waterfront when the naval forces arrived in July 1941. The contractors began work with 150 Irish workmen in August. Considerable delay on major projects was caused by lack of a rock crusher which was needed for road construction. The nearest commercial quarry was 25 miles away. Pile-driving for the pier, and construction of personnel buildings, hospital, roads, reservoirs, and a water-filtering and purification plant were under way when the United States entered the war in December 1941. The scope of the proposed work was reduced one-third at that time. It was decided to provide the submarine facilities and the repair shops as planned, but to delete destroyer facilities, especially as the critical machine tools were required elsewhere. The British agreed to install whatever tools were required for the modified program. Waterfront work for destroyers, which had not been started, was cancelled, and a substantial reduction was made in the size of supporting activities, the tank farm, hospital, and others. In April 1942, all projects except the tank farm, materials for which had been delayed, were well under way, and the British were progressively occupying the base. Shortly thereafter, in june, the contractor's crew was shifted to the Dumbartonshire pipeline. The decision to undertake the North African campaign occasioned a return of Rosneath to the United States Navy as a staging and training base for amphibious forces. It was commissioned a United States naval training base, August 24, 1942, and part of the contractor's force was returned to assume maintenance. Two important activities conducted there in the preparation for the invasion were a fire-fighting school and a practice-landing activity. In October, contract work at the other bases was nearing an end. Lough Erne and Loch Ryan were finished, and Londonderry was nearly so. Emphasis in American work was swinging to the pipeline. Rosneath was turned over to the British for occupancy, a detachment of Seabees remaining to assist in the maintenance of the base and of special United States equipment. 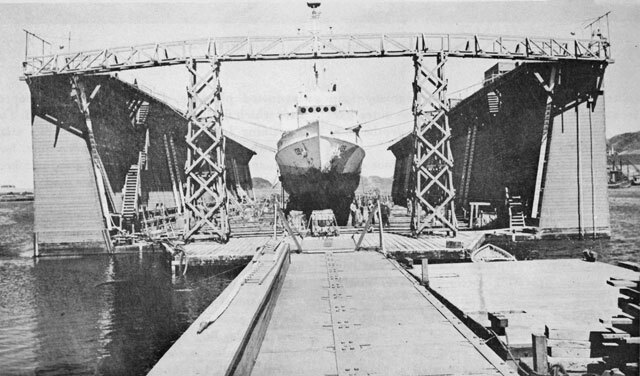 Facilities at Rosneath included a large wooden wharf which provided 4,750 lineal feet if deep-water berthing space and 1,500 lineal feet of shallow-water berthing space, including four submarine slips; 64 dolphin berths for LCM boats; a calibration range and degaussing slip; a marine railway for amphibious landing craft; and ammunition dump; 21 storage warehouses; a 200-bed hospital; eleven 10,000-barrel fuel-oil tanks and ten 14,400-gallon gasoline tanks with a distribution system to the waterfront; 153 air-raid shelters; housing and messing facilities for 4,500 officers and men (in 1944 Rosneath subsisted more than 6,300 officers and men); and 10 miles of water-bound macadam roadway. For the wharf and finger piers, 1,400 piles, from 65 to 80 feet long, and 400 piles, 80 to 90 feet long, were used. Many of the piles required splicing. In this sparsely populated and relatively inaccessible section, adequate labor could be obtained only by preparing living quarters for the laborers. One of the first tasks was to build Camp Clachen, just north of Rosneath village, with facilities for 400 men. At the height of the work of preparing for British occupation in April and May 1942, there were 325 Americans, 1000 Irishmen, and 250 British working on the project. Huts at Rosneath were divided into groups centering around galley units, each group designed for 500 men, on a basis of 10 men for each sleeping hut. 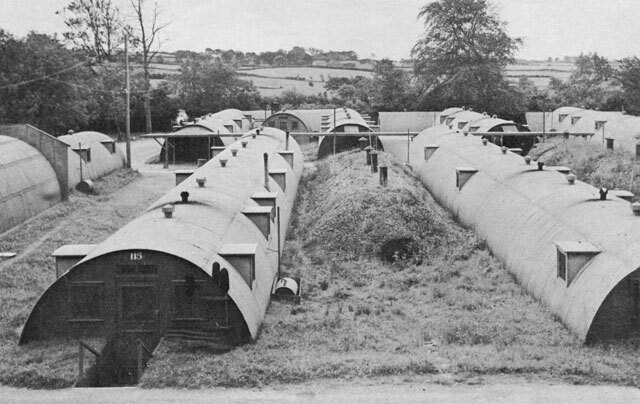 Huts were placed in an irregular fashion among trees, with bomb shelters and miscellaneous service huts evenly distributed. At the hospital, located a mile from Rosneath, on a hillside field overlooking the Firth of Clyde, 68 hospital huts were arranged in fan shape, with the galley unit at the hub, and connected by covered concrete walks. Portkil Hotel and its near-by cottage were repaired for use as quarters. On the other side of the peninsula, 3 miles from Rosneath, ordnance was stored in 14 magazines, each 20 by 50 feet. Three houses were renovated for quarters. of the peaty nature of the surrounding soil, the water had to be both filtered and sterilized. One result of plans for reduction of the base was the modification in orders so that certain material could be procured locally whenever possible. These materials included electrical equipment, gasoline-storage tanks, brick, cement, concrete aggregates, and drain pipe. The 29th Seabees, which arrived in November and December of 1942, took over construction and maintenance work as the last of the contractor's force was withdrawn to the pipeline project. 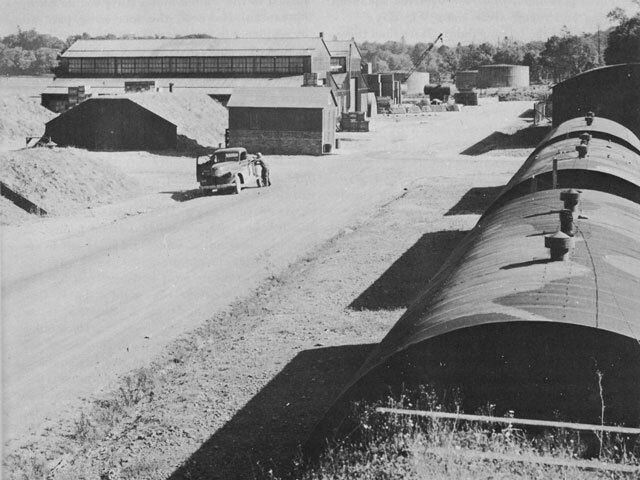 Work done by the Seabees included completion of a marine railway and erection of four workshops, 20 nissen huts for quarters, eight 10,000-barrel fuel tanks, two pumping stations and fuel lines, a laundry, and roads, as well as the renovating of buildings for a hospital and administration offices. When a temporary lull in European naval operations occurred after the successful accomplishment of the North African venture, need for the continued use of Rosneath by our Navy, for the moment subsided, and it was agreed to return the base to the British, with some reservation, on February 1, 1943. Except for piers and quarters required for a United States Navy submarine squadron which continued to operate, the base was placed under British control. All except a maintenance force of 230 Seabees were transferred to Londonderry to relieve contract civilians there. The 29th Battalion was replaced by the 97th in September 1943, when the 29th went to southern England to build bases in preparation for the invasion of Normandy. Then, on August 20, 1943, Rosneath was recommissioned to act as a receiving station for United States naval activities in the United Kingdom. Between August 1943 and August 1944, thousands of men were received there from the United States and transferred to various ships and stations in the United Kingdom. Rosneath also acted as a training, supply, and maintenance base for large units such as the gunfire support group of the 11th Amphibious Forces, with 1900 men, three units of 1500 each, and another unit with 1250 men. Up to the time of the Normandy invasion the harbor at Rosneath was continuously occupied by ships and craft which were being repaired and furnished with supplies. After the invasion, hundreds of survivors were accommodated, 3,200 in the month of June. Later, 2,000 to 3,000 men were processed each month for transfer. With the war's end fast approaching in Europe, the need for the base declined and men and materials were shipped to more active areas. The last major work was the construction of a large Red Cross club for the recreation of personnel at this isolated post. The base was officially closed on May 5, 1945, and in June the Seabees were withdrawn, with the exception of one officer and a few men who remained for a month or so to instruct the British in the use of American equipment. Thus, for the final time the Rosneath base was returned to the British, and the United States Navy's partnership with the British in Scotland was dissolved after four years of close cooperation. The rapid progress which was made by Navy contractors in the construction of the four bases in the United Kingdom made it evident, late in 1941, that skilled American engineers and mechanics soon would be available from these high-priority projects. It was decided that they might well be used to augment the facilities existing in Great Britain for the distribution of petroleum products. Enlisting the assistance of major American oil companies, and in consultation with the British Admiralty and Petroleum Board, the Bureau of Yards and Docks planned a pipeline in Dumbartonshire, Scotland. This 25-mile pipeline, a part of the Gare Loch installation, was laid between Old Kilpatrick (Bowling) and Loch Long, off the Firth of Clyde. The purpose of the line was to provide a connection between the pipeline network already installed between Edinburgh and Glasgow, and Old Kilpatrick, and to extend this connection to Finnart on Loch Long, where discharging of tankers and fueling of surface craft might proceed in an unrestricted channel which could not be closed by sinkings through bombing attacks. The pipeline was a double line, consisting of a 12-inch line for fuel oil and an 8-inch line for refined products. The terminus for refined products was in existing space at the British Petroleum Board tank farm at Old Kilpatrick. In addition, there was an 8-inch branch line which ran south the length of the peninsula, some 7 miles, to serve the tank farm at Rosneath. line. The 25-miles route rose from near sea-level at both ends to an elevation of more than 600 feet at the summit. Pumping plants capable of handling pressures up to 750 pounds per square inch were required for both lines at Finnart, and, as the system provided for two-way flow, they were duplicated for the 8-inch line at Bowling and for the 12-inch at Old Kilpatrick. 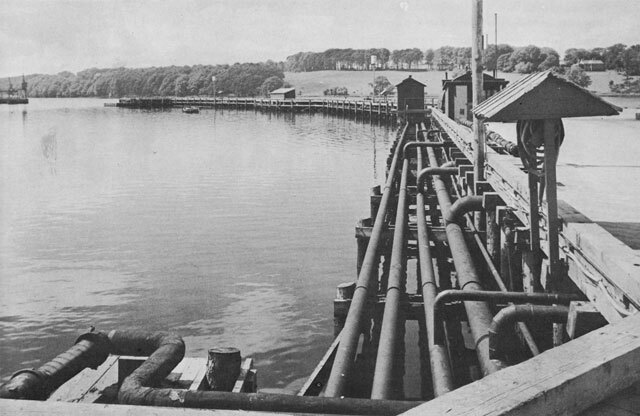 At the Finnart terminus, on Loch Long, other requisite facilities also were installed: a tanker berth (reinforced-concrete pier with 35-foot depth of water at low tide), 110,000 barrels of fuel-oil storage (with boilers for steam-heating the oil), and storage capacity for 75,000 barrels of lighter oils. The two fuel-oil tanks (55,000 barrels each) had been removed from the old Teapot Dome installation. Because of the acid condition of the soil, a bitumastic felt-wrapped coating was applied at a coating plant brought over from the United States. Installation began in May. As work on higher-priority projects was "topping out," more materials became available for this project, and it was possible to build the force up to 1,800 men. Just as the actual laying of pipe got under way in August, it was necessary for some of the contract personnel to undertake maintenance of Rosneath because of its return to the United States Navy. Though every effort had been made to get as much accomplished as possible during the favorable weather and long summer days, the task was not easy on the main lines. A more difficult terrain for pipeline construction could scarcely be imagined than this route through the southern highlands of Scotland. Sparsity of adequate highways necessitated the building of construction roads, a task which was made especially difficult by rugged country, peat bogs, and subsoil drains. These drains, which were spaced 25 feet apart, presented a dual problem. Not only did they have to be replaced in workable order, but also, when cut by the ditchers, they had to be repaired immediately because they poured water into trenches dug for the line. The incessant rainfall, 5 to 10 inches per month, kept the earth perpetually saturated. 194 men from the battalion who had completed their work at Londonderry, set out to finish the project. Shipments of material arrived. By July, both lines had been completed and tested, and the installations were turned over to the British Petroleum Board for maintenance and operation. On July 31, 1943, all Seabee personnel were withdrawn. The original plan for a naval seaplane base of Loch Ryan, at Stranraer, was to provide facilities identical with those at Lough Erne, in Ireland. Its location, overlooking the North Channel and the Irish Sea, made it an ideal springboard for seaplanes guarding the western approaches to the British Isles. Because of subsequent expansion in Ireland and reduction in Scotland, Loch Ryan was outstripped in size by Lough Erne, and eventually was the smallest of the four bases. Loch Ryan, a narrow bay, 8 miles long and 2 miles wide, on the southern tip of Scotland, is almost enclosed by a hook of land. Just south of the Firth of Clyde, the bay lies only 25 miles from Ireland. Between lay a favorite hunting-ground for German submarines, the North Channel, which led from the Atlantic Ocean to the Irish Sea. Engineering problems were somewhat simplified by the local terrain. At Wig Bay, on the western shore of the Loch, a headland narrowed its neck to less than a mile, and open fields sloped gently upward from the level shore to provide suitable sites for seaplane installations; wooded acres inland furnished excellent dispersal area. Stranraer, a little village at the base of Loch Ryan, served as principal terminus for construction cargoes. The Royal Air Force was already operating seaplanes from the Loch and was occupying a considerable stretch of the shore, so that it was necessary to pair the new squadron areas to the north and south of the Royal Air Force location. In the wooded area behind the shore, near station headquarters at Corsewall House, was built the administration area for headquarters personnel, and farther north, part of the ammunition-storage magazines. Seaplane facilities built near Corsewall included five nose hangars, sixty-six 5,000-gallon tanks for aviation gasoline and diesel oil, and 1,800,000 square feet of mesh surfaced parking area. The main personnel camps, for 1500 men, the 700-bed hospital, and the remainder of the ammunition depot were scattered 4 miles to the south and west, around Lochnaw Castle, near the middle of the 5-mile-wide peninsula, which separates Loch Ryan from the North Channel. the Corsewall area, was begun in July 1941 and was complete by the end of August. Rented rock-crushing equipment supplemented local purchases of stone for this operation. In spite of this start, it was not feasible to expand the scope of the construction as rapidly as might have been desired. Other bases, particularly Londonderry, had first priority, and the trickle of materials reaching Loch Ryan was small. Early efforts were confined to essential projects around Corsewall. In September, the contractor's force moved into newly completed huts, and as rapidly as they could be quartered, three companies of Royal Engineers arrived to unload shipments of construction materials and to supplement the scarce local labor. By the time October rains made work difficult, the Corsewall projects were well out of the mud, and grading had commenced for the operations area south of the Royal Air Force station, as well as at the main hut-camp at Lochnaw. The United States' entry into the war had an immediate and dual effect on the project. Not only did the rapid completion of essential naval facilities in the British Isles appear imperative, but even higher priorities had to be assigned to the Irish bases. The result was a drastic reduction in the scope of the work at Loch Ryan. Operating facilities for two squadrons, planned south of the Royal Air Force station, were deleted, as well as half of the ammunition depot planned at Lochnaw and one-third of the personnel area there. Work on the remaining projects was continued with redoubled vigor. as rapidly as receipts of American materials (via Londonderry) and the weather would allow. Camp facilities at Corsewall were now adequate to quarter as large a labor force as could be employed profitably, and there were more than 800 men, including 110 Americans and 450 Royal Engineers, at work. Pressure was exerted to complete remaining projects in the Lochnaw area, the 200-bed hospital and 1000-man camp, in addition to the Corsewall work. By March, broad strategic considerations had forced the decision to alter the future of the two flying-boat bases. 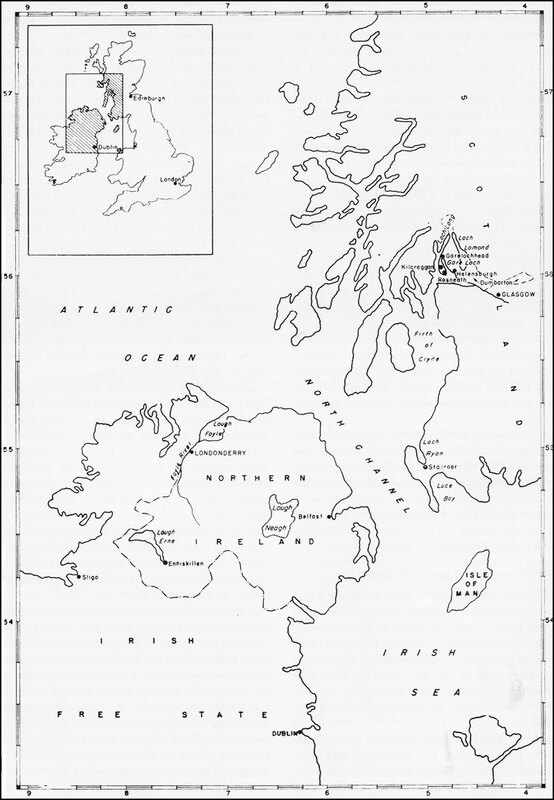 No United States Navy seaplanes were to operate from the British Isles. As a result of this change in plan the Navy transferred the base to the Royal Air Force to augment their facilities at the Loch. In order that the immediate value of the installations could be fully realized, it was agreed that as rapidly as each facility was completed it would be transferred to the Royal Air Force and put into operation. The Corsewall camp was occupied in May by 60 Royal Air Force personnel, who took over the squadron operating and repair areas along Wig Bay. This marked the turning point. More than three-quarters of the job was done. Steady progress continued, but the pace slackened as personnel and equipment were directed to the Dumbartonshire pipe lone and to the more immediately essential work at Londonderry and Rosneath. During September the last of the contractor's American force was gradually withdrawn to other jobs. On September 24, the formal transfer was completed with the proviso, as at Lough Erne, that, if necessary, it would be returned, intact, to the United States Forces. Work at Loch Ryan, the smallest of the United Kingdom contract bases, was completed under difficulties heightened by its isolated location and the low priority assigned. In all, 610 buildings were constructed, including seven major structures, and 10 mils of surfaced roads were laid, As at the other bases the utilities and services installed would suffice for a small city, in this case one of 2500 population. In the seaplane-operating areas, almost two million square feet of steel mesh had been laid, and there was fuel-storage capacity for 330,000 gallons of petroleum products. It was never necessary for Loch Ryan to be returned to the United States Navy for its European operations. However, the increasing part played by seaplanes in waging and winning the vital battle against the submarine menace was aided in considerable measure by the facilities of this base.